AS THE French continue to mourn the loss of 17 people killed in the attacks that began at the Charlie Hebdo magazine last week, and with news today of arrests in Paris, many are also aware of what is at stake as various groups vie to attach their own interests to the #JeSuisCharlie cause. Jim O’Hagan, a researcher working in Northern Ireland who studied politics in Paris, reflects on the faultlines in France. VISITORS to Paris expecting a city brimming with amour and freedom may be somewhat disappointed if they actually had to live there. For many of its inhabitants, and despite its obvious appeals, Paris is a necessity rather than a choice. It’s where they have to go to get a job or study and when the time comes they are quick to leave their small, over-priced rental accommodation and live elsewhere in this beautiful country. The cyclical monotony of my own experience living in the city is well summarised by the almost cliché Parisian expression, ‘Metro, Boulot, Dodo’ or ‘Tube, Work, Snooze’. In fact after much anticipation, so many tourists are disappointed by what they find in Paris when they stray beyond the main attractions, they suffer what is now recognised as ‘Paris Syndrome’. In reality marginalisation and segregation are particularly rife in Paris and can even be seen in the city’s urban planning. Where cities like London expanded beyond their borders and engulfed surrounding towns and villages, Paris swelled within a large ring road and population density was not the only thing which inflated. Since the 1960s ghettos have been maintained on the other side of the ‘peripherique’ a huge motorway encircling the city. Life in ‘le banlieue’ (‘the suburbs’), as it is known, could not be more stark when compared to the cafés, galleries and boutiques of central Paris, they are some of the country’s most impoverished and deprived areas. Known by the Government as ‘Sensitive Urban Zones’ more than half the residents are foreign nationals, chiefly Algerian, Moroccan and sub-Saharan African in background. In 2013 it was reported three-quarters lived in subsidised housing and 36% were below the poverty line, a figure which was three times the national average. Wider European unrest regarding Muslims and ethnic minorities may be rooted in the colonial past, immigration and the ‘War on Terror’ but there has arguably been an increase in Neo-colonialist discourse in line with the recent rise of the right wing across Europe. In France Nicolas Sarkozy’s Right-wing party the UMP’s time in power represented a rather aggressive period in the marginalisation of several ethnic minorities in France including Muslims and people of Arabic and Maghrebian origin, these included divisive debates around the banning of the burka, the expulsion of the Roma Immigrants and curfews affecting large parts of the banlieue. At the same time, public debate on the ‘Identité Nationale’ both fuelled Islamophobia in the European country with the most Muslims, and contributed to the radicalisation of certain factions of the Muslim community. The debate quickly enveloped immigration policies and Islam’s place in France, polarising already tense communities. At this time the UMP was trying to claw-back its electorate from Marine Le Pen’s extreme-right party Le Front National, (but to little avail, as the FN had 17.9% of the vote for the presidential election and 25% of 2014’s European election), but this accounts for the increasingly tough legislation in relation to foreign nationals and ethnic groups. At the same time, Islamophobic discourse abounded, one example being the widely reported comment of French Interior Minister Claude Guéant who described growing numbers of Muslims as ‘a problem’. With such a climate at home, coupled with the French invasion of Mali it is little wonder that tensions have been gathering. Radicalisation in French prisons, recognised as instrumental in forming would-be terrorists, is seen to be on the increase. The Kouachi brothers, the perpetrators of the attack on Charlie Hebdo, were themselves graduates of the ‘Jihadist Finishing School’. As Le Monde put it, they went from ‘petty delinquency to jihadism’ during their relatively short spells in prison. International conflicts have also nourished fundamentalism in France, in November of last year over 1000 French nationals are reported to have gone to Syria to train with jihadists. Growing fundamentalism also extends to ultra-conservative French Catholics who have enjoyed a resurgence in support. Collaborating with the extreme-right to denounce the gay marriage bill (‘marriage for everyone’), the ‘protest for everyone’ gathered enormous support on the ground (70,000 according to the police and 500,000 according to the organisers). Meanwhile, and indeed through its entire existence, satirical weekly Charlie Hebdo was continually embroiled in legal proceedings with a range of different actors: Catholic and Muslim groups united with politicians to attack the newspaper for its controversial publications. 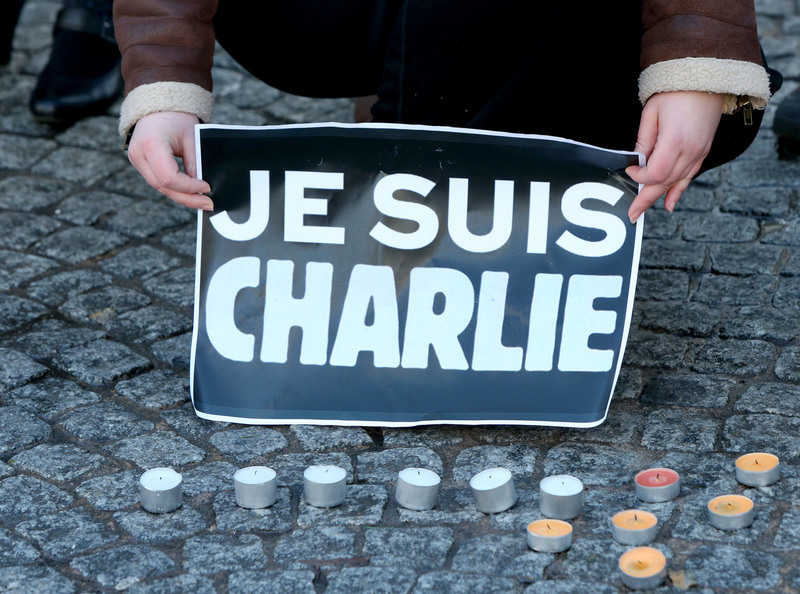 In 2005 La Grande Mosque de Paris sued Charlie Hebdo for two out of nine drawings depicting the prophet Mohamed. Accepting that satire has been a tradition in French culture since the Revolution, the Muslim Cleric of Paris conceded on what was deemed ‘blasphemous’ but condemned that which was ‘Islamophobic or racist’ in nature. For Charlie Hebdo, things remained relatively quiet from the end of the trial until its headquarters were burnt down in 2012 following yet another controversial image of Mohammed, though on that occasion no-one was injured. Finally came the events of January 7-9 that left 17 people dead, shook the French public, and sparked international displays of condemnation and solidarity. The satirical newspaper has rallied what staff it has left for this week’s publication, which once again depicts Mohammed with the caption ‘I am Charlie, All is forgiven’. This issue has already sold 3 million copies and increased their output to 5 million to meet demand. But how will it be seen in the Muslim community? In the wake of the Paris murders, several veiled women have been beaten, Mosques targeted and Canal Plus broadcast footage of Muslim men shaving their beards before going out in public for fear of revenge attacks. Last week’s violence has ignited debates around the essential need for press freedom, but also around the rights of minorities, plus the competing political agendas of a society experiencing huge social change. How will France cope? With arrests in Paris and a police raid on suspected terrorists in Brussels leaving two dead, we may well see more legislation similar to The Terrorist Act affecting civil liberties in general. The unifying element of the solidarity marches in Paris are a crucial part of the healing process and participants have said that despite everything the mood was a positive one, ‘very few were protesting in anger’. The French community we spoke to in Belfast, although of course shocked and saddened by the violent and frightening events in Paris, expressed their own fear that the benefactors of this could be the extremists from both sides of the political spectrum. Although touched by the displays of solidarity throughout the world and in France, some of those involved in the small but poignant events held in Belfast said that they were wary of seeming overly nationalistic. Those interviewed said they were put in the peculiar position when singing their National Anthem, Le Marseillaise, of wanting to publicly denounce the attacks and show their solidarity without being bundled together with the opportunistic extreme right who, although quiet in the media, mobilised a campaign on the ground during the massive demonstrations of solidarity across France. The international Muslim community has condemned terrorist acts and asked for its faith to be disassociated from acts of violence. On social media, they and other non-Muslims, gathered under the hashtag #JeSuisAhmed: ‘the policeman who died defending a magazine’s right to insult his religion and culture’.